Growing up, Kevork “Khach” Khachadurian always wanted to be a police officer. After the 9/11 attacks his aspirations shifted to becoming a U.S. Marine instead. He joined shortly after high school, going on tours to Cuba and Bahrain before deploying to Afghanistan in 2011. On Aug. 15, 2011, Corporal Khachadurian was on a three-day mission as an Infantry rifleman with the 1st Battalion, 5th Marines, in Sangin, Afghanistan, when he stepped on an improvised explosive device (IED). He immediately lost both legs in the blast, along with several fingers on his left hand and severe damage to his left forearm. Cpl Khachadurian never lost consciousness as his fellow Marines quickly evacuated him. He arrived in the United States at Walter Reed Medical Center a few days later, where he underwent countless surgeries. Three months after his injury, Cpl Khachadurian started physical therapy and began walking on prosthetics. After medically retiring in June 2013, Khach landed a job with the VA. He started out as a program support assistant, and is now a Veterans support representative. He enjoys the role as it allows him to work closely with the comrades he fought alongside. “I love that even though I can’t go back out there and fight with them, I’m still able to help by making sure my fellow Veterans and Servicemembers get the benefits they deserve,” he says. 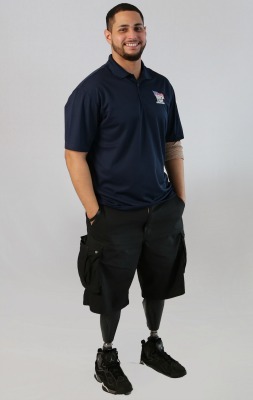 Once he receives his specially adapted custom Homes For Our Troops home, Khach believes he will be able to rest more and have more energy to put into furthering his career and helping other Veterans. He currently lives in a one bedroom apartment and prefers to use his wheelchair while at home. The space is narrow, making it difficult to navigate the hallways. In the open layout of an HFOT home, all appliances, cabinets, and shelves will be within Khach’s reach. The extra space will give Khach room to expand his interests. He has a passion for music and DJ-ing, and would love to create a music studio in his home. Khach has also become an avid athlete in the years since his injury. He plays sitting volleyball and is on the USA Warriors Sled Hockey team. Originally from Florida, Khach has developed a community of friends in the Washington D.C. area during his time at Walter Reed, and is choosing to remain there and build his home in Virginia. Khach says this home will be the foundation for the rest of his life, and he is incredibly grateful to HFOT’s donors and supporters. “Living with a disability can be really stressful at times, but coming home to an HFOT home will take all the stress away,” he says.